By Peter Anderson 14 Comments - The content of this website often contains affiliate links and I may be compensated if you buy through those links (at no cost to you!). Learn more about how we make money. Last edited April 24, 2012 . I first started reading personal finance blogs back in 2006-2007 when my wife and I were just beginning to get serious about our finances. 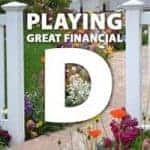 I was stumbled onto the personal finance blogosphere when I was investigating a question about retirement accounts, and after reading some blogs for a few weeks, I was struck with just how interesting a topic personal finance was. There are so many angles to examine when it comes to money, from the psychology of money, to the technical details of setting up a retirement account. I was hooked. After reading those blogs for a year or more, I started reading how it was possible to start your own blog and turn it into a second income. You could make money from display advertising, Adsense ads, affiliate marketing and a variety of other sources as well. I read stories from some bloggers how they had quit their day jobs to become full time bloggers because they'd become so successful at it. I decided that I wanted to start blogging as well. I'll admit that when I started, one of my main motivating factors was that I wanted to make a second income for my family. My wife and I were planning on having kids, and we knew she would be staying home with our kids when that day came, so i wanted to create some additional income. Blogging seemed to be a decent way to do that. When I started looking into blogging, however, I realized that while there was stuff available on the topic of blogging and how to get started, not a lot of the materials were very professional. they were lacking. I read a few blog posts on the topic of how to get started, but for the most part I just muddled my way through, learning as I went. While I've been more successful at blogging than I could have ever imagined, I wish I had some better resources back then to help me as I got started. If I had, the learning curve could have been cut significantly, and I could have started doing the right things from the start. Luckily, if you're starting a blog today, there are some better resources out there, including the ones I'm going to mention today. One of the first blogs I started reading back in 2007, and one of the ones that inspired me to start my own, was the site ChristianPF.com, written by Bob Lotich. The site was one of the very first Christian personal finance sites, and I knew that was the niche I wanted my own blog to be in. Bob was very approachable and has helped me over the years when I had questions – and I was lucky enough to meet him last year at the Financial Blogger Conference in Chicago. Bob is a full time blogger, and really knows his stuff when it comes to the art of blogging – not just through some courses he took somewhere, but through first hand experience. 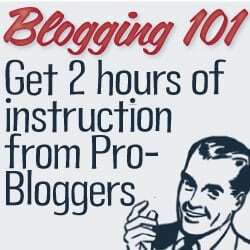 Bob has put together some great video courses on blogging and recently released them. There are currently 3 modules that you can take part in that I've also had a chance view. Going through the 101 course will help brand new bloggers and those who need to know the basics a solid foundation that your blogging empire will be built on. I've had a chance to go through the videos and I'll tell you right now that the production value is great, and Bob and his partner Jonathan both know what they're talking about when it comes to how to create and grow a money making blog. Is it possible to build wealth with an average income? According to author Thomas J. Stanley it is, if you play "great financial defense". Last Edited: 24th April 2012 The content of biblemoneymatters.com is for general information purposes only and does not constitute professional advice. Visitors to biblemoneymatters.com should not act upon the content or information without first seeking appropriate professional advice. In accordance with the latest FTC guidelines, we declare that we have a financial relationship with every company mentioned on this site. I do blog regularly, so I would really like to step it up and have it contribute at least SOMETHING to the family income! I’m an amateur blogger and would like to improve my skills. This is a great giveaway, Peter. Anyone who wins will be happy to have in one place all the information that they will need to start a blog. Awesome giveaway, Peter! I’ll include this in my round-up on Saturday! There are so many “how to make money on the internet” programs out there. Most of them focus on how to make money online by telling others how to make money online. It is refreshing to find a program that explains how to do it based on your personal passions and interests! Thanks for sharing this great deal! I’m a fairly new blogger and am definitely looking for ways to improve my blog! I need to win these because my blogging needs to be taken to the next level. I came into personal finance blogging much the same was the author did. I realized I knew nothing about money, set out to change that, learned a lot, and wanted to share what I knew. I know that people do make money at blogging, and I’ve always thought it would be rather nice as a side income stream, but while I’ve done a pretty good job of setting up my blog, I’m lost as to how to monetize it. The Blogging Your Passion University 201 course would be just about perfect for me. I would like to win this because one of my goals this year is to start my own blog. I’ve been thinking about it for a long time and I’ve realized that I need to get it going. This package would help me do it right the first time. I would love to blog about my passions and earn some money to pay off credit cards. What a wonderful combination. However, I’ve been blogging aimlessly and need some guidance. Great blog, would love to be able to expand mine! I would love to improve my blogging! I would like to see how to make money blogging!